Apec offers the most advanced, comprehensively tested and environmentally friendly brake pads for the aftermarket. Over 18 million Apec brake pads are produced every year, to cover 99% of all cars and LCVs in the UK and Ireland. This includes not only modern cars, but also older vehicles from the 1960s onwards, all listed in our online catalogue. From the leading independent brand. Apec offers the most advanced, comprehensively tested and environmentally friendly brake pads for the aftermarket. 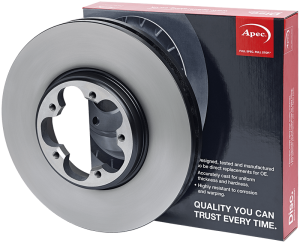 Over 18 million Apec brake pads are produced every year, to cover 99% of all cars and LCVs in the UK and Ireland. This includes not only modern cars, but also older vehicles from the 1960s onwards.